What’s the Secret to Building Self-Confidence? If you are currently struggling with living a life of fear and compulsion — forever working to keep others happy with you — so much so that it keeps you up at night and on edge by day, the five minutes you spend reading this page could be the most valuable five minutes of your day. My name is Antoinetta Vogels and years ago, I was right where you are, right now. I have walked in your shoes. I know your fear and heartache, and I have lived your pain and heartbreak. When I was growing up, I was prevented (albeit unintentionally) from being myself, which resulted in many complications for me, from bouts of unreasonable anger to compulsive perfectionism and persistent insomnia. I had to figure out the cause of what was bothering me. It took me a long time, but I managed to find my sense of self. I know how it feels to have my sleep, my productivity, my world – including my hopes and dreams for the future -consumed by the chaos of experiencing a lack of sense of self. I also now know how it feels to have emerged through that experience whole and strong within myself and within my relationship with myself and my loved ones, and I want you to know that you can too. You too can get your life back, no matter how bleak things look right now. You too can smile again, laugh again, sleep again, and have hope in the future again! Your happiness in life depends on your motivation. What motivates you in times of stress at home, at work, and in your relationships? Do you really know where that core value for motivation came from? That long forgotten source for your personal motivation is what you need to really understand. When you have the right tools, you can become a catalyst in your own life by knowing why you do what you do. And because more than anything, I want you, your entire family, and your communities to understand what really makes you happy and whole as the individuals you were born to be, I’m offering you the key to gaining a Healthy Sense of Self for an incredibly discounted price. 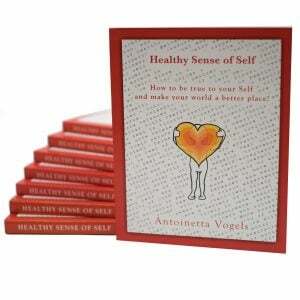 Healthy Sense of Self: How to be true to your Self and make your world a better place! explains the method I’ve discovered for living a successful and happy life. It’s all about what I call the Sense of Self Method, and with it, you will learn the principles that freed me from anxiety and sleepless nights. In the book, you will learn how to regain control of your life, while gaining insight on how to communicate in ways that encourage your loved ones to support you and your personal dreams and plans—even when they don’t agree with you about them. Thanks to the Sense of Self Method, my family and I now enjoy the benefits of having regained a sense of self. We still have disagreements, struggles, and disappointments, of course. But at the end of the day, we have love and respect for each other. Each of us expresses our own self and makes independent choices. We live and let each other live as we choose with the utmost support! Now it’s your turn to create that for yourself and your family and loved ones—because you deserve it. Grab yourself a copy of the book that offers you a path to your sense of self today. #2 You will understand why you made those decisions. We have the choice of doing or not doing. With a Healthy Sense of Self, your being will no longer be completed by or dependent on any doing. As we free ourselves for our dependency on outside influences, we learn to truly see and understand the reasons behind our actions. With the road blocks no longer in our line of sight, our true intentions become clearer. #3 You will sleep better. The entire Healthy Sense of Self method was created by a need to find restful sleep each and every night no matter what the day has thrown at us. It is only with the understanding of our own self that we able to put the worries of the day behind us. Not being dependent on the outcome of our activities or on what others think allows us to “Feel-good-about-ourselves” so we can let things go. #4 Your relationships will improve. Ever feel that intense tension while visiting family during Christmas when a sibling brings up a past argument? It happens to the best of us. But rest assured that when you become more conscious of all of the decisions you make you will be able to think more clearly in heated moments, improving your relationships with those around you. #5 Your past will no longer dictate your future. By gaining a Restored Sense of Self™ we are able to make decisions that do not revolve around things that occurred in our lives in the past. With insight on where your motives to do or avoid certain things stem from, bad experiences no longer have the power to suffocate your day to day life. #6 You will know how to solve your own problems. Been going to therapists for years with no avail? That’s because there’s no one who will ever be able to get to the truest root of any issues in your life other than you. With a healthy Sense of Self, you’ll be able to see those roots more clearly than ever before and take action in favor of your self. #7 You can help create a better world. Having a Healthy Sense of Self improves one’s own quality of life, which affects the way that person treats all others in their families and all they come into contact on a daily basis. By teaching others what we can about the Healthy Sense of Self Method we are creating a ripple that will continue to spread its influence everywhere it travels. Start right now! An abundant, bright future full of all of these amazing benefits awaits you! More than anything, I want the quality of life, love, and support that I enjoy for you and your family. It’s never too late to have a happy childhood, a connected family, and a powerful and vibrant life of your own. To learn more about how to get a Healthy Sense of Self be sure to subscribe to our newsletter and check out our online course. 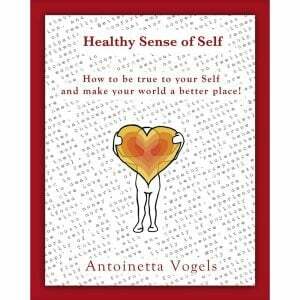 Antoinetta J. Vogels, founder and CEO of HEALTHYSENSEOFSELF, LLC is a former bassoonist of the Netherlands Philharmonic Orchestra and mother of two. For over 20 years she recorded her thoughts and emotional processes to better understand her inner workings and make the changes necessary to conquer severe insomnia and become a happier and more productive person. Connecting the dots of her findings led to the Sense of Self Method. Antoinetta is not a doctor or psychiatrist; her insights are based on her own experience and her own psyche. She believes that each person has the right to be who he or she is, and that living in such a way leads to good health, happiness, and success. Through the Sense of Self Method, she hopes to contribute to a better, more peaceful world by helping you help yourself and gain control of your own life and make it yours!